Cardiff Philatelic Society were invited to join the launch party for the final miniature sheet in the series celebrating the four countries of the United Kingdom. Launched on 26th February 2009 in Cardiff Bay the sheet has been designed by Silk Pearce and printed in Lithography by De La Rue. 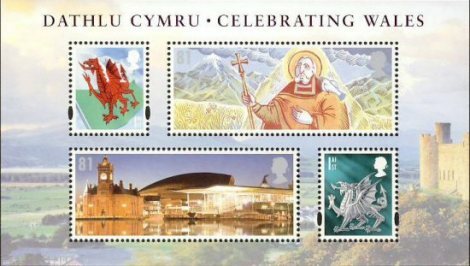 The stamps on the sheet depict the Welsh flag, Welsh dragon, St David and the National Assembly for Wales building with the background being Harlech Castle. 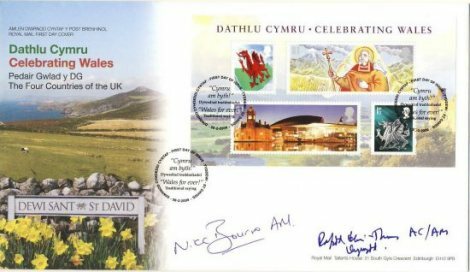 Celebrating Wales Miniature Sheet First Day Cover with a St. Davids "Cymry am byth!" cancellation signed by the Presiding Officer, Lord Dafydd Ellis-Thomas and Nick Bourne AM.